I was meditating recently when I had an incredible realization – I am ten years younger than I actually am. Of course, this realization was unusual. It’s not as though I have the ability to turn back time, or to jump back ten years to relive the past decade. But still, the thought came over me and I couldn’t shake it. And you know what? The oddest thing happened. I felt amazing for the rest of the day. There was a renewed energy in my thoughts and actions. I felt physically and emotionally better. It almost felt like, well, I was ten years younger. That’s when it occurred to me – lately I have been dwelling on the idea of my best years being behind me. During my meditation, I realized this doesn’t have to be true. Age is just a number. these societal ideas to heart – feeling hurt or somehow less than we once were as the years go by. As this isn’t a positive way of looking at things, realize that; you are as youthful, joyful, and content as you believe you are. You are in full control of how you feel – both about your body, your mind, and your life. Your physical age doesn’t need to have an impact on how you view yourself. Many people use their age to measure themselves, or their success in life. Instead, we should reframe how we view ourselves (and our win’s – big and small). If we are content with ourselves, with where we’re at in life, our age has no bearing on that. If we’re not content with where we’re at – whether we’re young or old – we have the power to change things. No matter how many years we have behind or ahead of us, they’re all equally wonderful. Let’s celebrate each one. People often talk about how living with intention can help you to feel happier and more fulfilled. It may sound like a too-good-to-be-true solution to all your problems – but it’s very true. Starting each day with intention can have a dramatically positive impact on not just your mood, but the way you view your life, yourself, and those around you. The definition of intention is an aim or a plan. Living with intention is to have an aim or a plan for your life, or maybe just for your day, or for the next hour. Life can be busy, and it can also be full of unpredictable events or interactions that cause us stress. That makes it that much more important for us to take control and center ourselves when and where we can. We all deserve to live an intentional life, and one of the ways we can achieve this is through starting our day with intention. It doesn’t take long – between five and fifteen minutes every morning – and there are several ways you can go about centering yourself and starting your day intentionally. Meditation is not a one-size-fits-all practice, which is why I like it so much for an intentional practice. Rather than trying to clear your mind of thoughts, focus on what you want your day to be. Focus on how you want to feel. Do you want to feel nurtured? Loved? Productive? Creative? Whatever you want out of your day, focus on that for just a few minutes. Over the course of your day, when you feel overwhelmed or like you’re not in control, revisit this intention. Are your decisions moving you toward the way you want to feel or away from them? Make time in your morning to take a 5-15 minute walk. Breathe in the fresh air, take in your surroundings. Use this time to clear your head, and take deep, relaxing breaths. By taking a small bit of time in the morning to focus on and invest in yourself, you are prioritizing you today. Getting your blood flowing wakes up your mind, contributes to your physical health, and centers your emotions. People often shy away from journaling because they feel that their writing has to be top notch, or they’re worried they won’t have anything to journal about. Journaling might not be for everyone, but taking a few minutes at the start of your day to jot down, even if only in bulleted form, how you want to feel today and what you want your life to look like – from big dreams to simple daily goals – can often center you and help you work towards those goals. The unfolding of a new year gives us a wonderful opportunity to reconnect with ourselves, that part within we perhaps call spirit or essence. As we take stock of our physical health, it is equally as valuable to get a psyche check-up, to quietly enter that realm of your being that is unique authentic, unspoiled. You may ask the questions: Where am I on my journey? Does the direction I am moving in match my intention? You may also contemplate your life’s purpose, which may be many folds. To realize yourself more fully takes courage and reflection. Once you take the time to travel inward, stay for a bit. Clear away all of the stresses and influences that don’t really represent your true feelings or passions. How can you simplify? What practices can you begin that will move you closer to the vision of your best self? Science tells us it takes twenty-one days to create a habit. What positive habit do you want to implement into your life? For example, maybe you want to stop reaching for your phone or device first thing in the morning. You would prefer to start your day reading reflective material to set an encouraging tone for you day. Place the materiel you want to read where your phone would have been, do this for 21 days and reap the rewards. Connecting within will help you realize these missing bits of your life that can have a profoundly positive impact. while a hundred a day pour out of a kiln in Baghdad. while an infant remains helpless for many years. while the second can find stars and galaxies within. In other words, exploring your values in your inner life takes time; there is no app to click or short cut, which is why we often call life a journey. By checking in, you see how your navigation is going. Have you gotten off course or has your desired destination changed, altered with the wisdom of time? Similar to a marriage or relationship with a partner, to keep it healthy you need to hear one another. It is the same with the self. How then do you go about connecting within? How do we practice presence from that heart space all of us have? One simple suggestion is to carve out time for stillness. Rather than pile more on your daily to do list, take something off and replace it with meditation. If you are allergic to the word meditation, you can talk a walk, without your headphones. Or if you live in the city, walk with quiet lulling thoughtful music that beckons your inner thoughts. Listen a little less to news. A fifteen-minute reflection can refuel your commitment to living a life that you yearn for rather than feeling as though your destiny is in the hands of others. Read reflective books and let the works marinate into your psyche. We often over expose ourselves to harsh corrosive stimuli, how about swapping that out for books, podcasts or CD’s that support our inner growth? As 2017 evolves, give yourself the gift of time. Time for inner perspective to hug that person waving from the vista of your true self and enjoy the delightful discoveries that shape your life’s happiness and purpose. Winter for many is a time when colds and flus become a menace in our lives. If this is true for you then finding ways to stay conscious of what your body is telling you is paramount. Notice things like if you feel more tired than usual, or a tiny tickle in your throat, as such observations and treating them can be the difference between having a cold and it developing into flu. Many of us are taught not to trust our bodies. If you listen, your body will tell you when it is time to slow down. Often we wait until someone of authority such as a doctor or our mother tells us to rest or to take a preventative homeopathic remedy, rather than thinking of it ourselves. By listening to our bodies and trusting in them we begin to take better care of ourselves. By being more aware of our bodies we may prevent or lessen the impact of the colds and flus we encounter during the winter season or any season. Self-care is a lifestyle; it incorporates daily habits to ensure that you are taking time for yourself in the best possible ways – physically, emotionally, mentally and spiritually. Every morning set your alarm early to allow for 10-20 minutes of meditation. Following your meditation do a quick body scan. This will allow you to hear what your body has to say. Mindfulness will help you slow down and notice the details around you and within you. Once you are more aware, you might notice that tickle in your throat before it becomes a cough. For example: Every time you touch your phone, think about that phone. What color is it, what is the shape, how does it feel against your hand? Doing this will help you be in the moment every time you touch your phone. Eventually this will begin to occur naturally with other things or events as well. Unplug! Sleep better and leave your devices outside of the bedroom at night. Exercise in whatever way appeals to you. Walk, dance, swim, yoga, the gym. Do something, even if it’s for 10 minutes in your living room. Exercise increases blood flow. Make small changes to create a healthy diet. Establish a routine for meals. Drink more water. Take power naps. 10 to 20 minutes once or twice a day. Establish a regular bedtime routine in the evening and plan for 7-8 hours of sleep. Your body will tell you how many hours you need, listen to it. During the stress of election time, have you found yourself overwhelmed or burned out by the onslaught of newsflashes? The chronic barrage of updates and social media stories can leave you feeling frustrated, sad, or helpless. Do you ever fantasize about escaping to a simpler less hectic way of life? One way to cope and tune out is to create a sanctuary where you can retreat and restore your sense of balance and inner harmony. What is a sacred space? A sanctuary is a sacred space; it is a uniquely personal place that you carve out to reconnect with stillness. A place that rejuvenates your nervous system and allows you to calm and center your energy. This can be a physical place or an imaginary space that with practice, you can access anywhere. If you have room to establish a small area dedicated for meditation or quiet time, try decorating it with relaxing photos of your favorite spots: perhaps pictures of nature; oceans, forests, sunsets, or hiking areas with waterfalls that you can place around you. Fill your sanctuary with objects that encourage you to travel within. If room is an issue, make it portable; set the serenity stage then dismantle it when you’re done. Taking the time to carve out a sanctuary sends strong permission signals allowing your body and mind to honor quiet time. Light candles, play soft soothing music and if need be, set a timer; even fifteen minutes can make an enormous difference. A sanctuary supports your efforts to drop inward to quiet the outside chatter, relieve stress and to approach life with a clearer, calmer mindset. Imagine if you never recharged your phone or computer? Creating a sacred space reboots your nervous system and disempowers fear and anxiety. The idea of opening up and closing down is like the very beating of our heart; the chambers open and close, both are necessary to sustain life. Rumi, the famous 13th century Persian Poet, noted. closing the fist always proceeds opening it. Shutting out the world allows you to open to your inner self. It takes you back to the you, unaffected or categorized by titles. There in the quiet chambers of your being you are free uninhibited by age, illness, or the past. Although multitasking is rewarded these days, it has detrimental effects on our ability to focus. Taking time to cultivate a sanctuary can boost your mental and physical well-being. If there simply is no room to create a physical space, then create one in your mind’s eye. Get comfy on the bed or sofa or throw pillows on the floor and close your eyes. Begin to imagine a place where you feel calm, secure, in harmony with nature; a sandy beach with a slight breeze, the warm sun on your back. Or in the mountains surrounded by autumn leaves and a babbling brook. Wherever your place is, close your eyes and create the sensory details, the smells and sounds; perhaps play nature sounds on your computer or phone. YouTube has a plethora of these kinds of soothing symphonies from the ocean to a crackling campfire. Once you’ve created a place in your mind’s eye, focus on your breathing. Slow your inhales and exhales to the count of five, this is guaranteed to induce relaxation. If you have set a timer, release any lingering concerns about time. Stay in your sacred space as long as you need and let tension and stress dissolve. In time and with practice, this inner haven can offer you solace whenever or wherever you need to drop in for a visit. As the days grow shorter and the animals prepare for hibernation, we too can slow down, settle in, and relish in the safety of your sacred sanctuary. A relationship breakup, workplace conflict, a feud with a family member or friend…these experiences can be difficult and may involve tense communications and stress. Most of us can recall a time when we felt that someone was causing us suffering, either intentionally or unintentionally. It can be challenging to see past the situation and the other person’s actions, which can color your view of them. It is easy to blame others for our feelings. While some of us are content with being swept up in a drama, others would rather apply a higher-self perspective to conflict. For those of us who desire the latter, how can we show compassion to people we perceive as causing us suffering? Try a perspective shift. Keep in mind that people who are hurting tend to hurt other people. However, it is up to us how we perceive our reality. We create our own hurt by what we say to ourselves about the other person. If we change our thoughts, our feelings will change. What are the facts about this situation? We usually have a story attached to what the other person is doing or not doing. We guess what they are thinking and what their intentions are. Think of how a lawyer might present the facts of a case in court. Hearsay, inner dialogue, feelings, and predictions aren’t useful there, and neither are they to you. Separating fact from story is helpful in avoiding emotionally charged thinking. How significant is this problem in the grand scheme of my life? How significant is this in relation to the timeline of the universe?While you may not prefer that someone is talking about you, being antagonistic, giving you the cold shoulder, etc., what are they really doing to you in this moment? Recognize that your thoughts about the other person are what are causing the feelings you don’t like. Shrinking the perceived enormity of your situation can allow you to regain perspective. Show yourself love. In times of stress, it is even more important to practice self-love. Whether it’s walking in nature, getting a massage, losing yourself in a great book, taking a yoga class…Take time for yourself doing things that are enjoyable and nurturing. Here are some of my videos explaining how to use meditation, breathing techniques, and laughter yoga to de-stress and re-center. Although you can’t control what someone else does, you can control how you process the experience and interact. I hope these points help you to release unsupportive feelings, as well a see the conflict from a more neutral standpoint. It is much easier to deal with these types of challenges when you are coming from a calm, clear place. Contemplate on this: Quieting your mind on a regular basis can result in both mental and physical well-being! How wonderful is that? Focus your attention on a single thing. It can be a visualized object, a word, a mantra, or just the rhythm of your breath. When you notice your mind has wandered (which our minds are prone to do), gently bring it back to the original focus. Over time, you will experience less distractions and greater singular focus. Some examples of this type of meditation: Buddhist meditation, Loving Kindness Meditation, Chakra Meditation, Kundalini Meditation, Sound Meditation, Mantra Meditation. Allow your mind to go as it may, without judgment or attachment. Tune in to all of your senses; be aware of sensations, thoughts, and feelings. Acknowledge them and then let them go. Your thoughts and awareness will flow freely in and out, like the waves of the ocean. Some examples of this type of meditation: Mindfulness meditation, Vipassana. Follow a guided meditation. Normally, you listen to a recording of a meditation that has a specific purpose, such as increasing energy, reducing anxiety, letting go of fear or anger, promoting restful sleep, raising levels of gratitude, etc. There are many different guided meditations available, which you can access online. I particularly enjoy Louise Hay. Try making meditation a part of your daily ritual, and see what good can result! We’ve all been there—we’re having a conversation that we don’t necessarily want to have and we begin to feel defensive. Our mind may start racing or our palms may start sweating. Anger starts rising up hot on our necks, and we’ve hit the point of either shutting down and tuning out or getting upset. Usually it’s with someone that we’ve been down this road with before. It’s true, right? We all find ourselves falling into the cycle of washing and rinsing out one issue, yet, before we’ve even finished ironing it out, we could already be facing more trouble from the same source. Our immediate response may be to act out of frustration or anger instead of a calm, collected place. 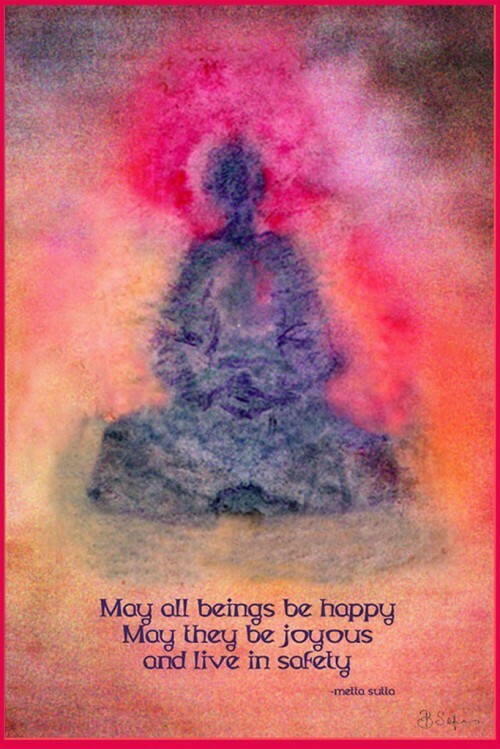 That’s were loving kindness-meditation comes in. Now—start the practice by cultivating someone in your mind that you’re close to. One that loves, honors, and respects you for who you are. They will be the guided thought for your meditation. Create a mantra based on that idea—and as you’re beginning to feel frustrated with a tough conversation, turn to that to help you make it through. Channel love within your mind and allow it to come through your thoughts and into your words. As you continue this mantra of love for yourself and love for others—you are beginning to set yourself free from the pain of difficult relationships. Changing your heart space to let light in instead of harboring darkness. Once we find peace in ourselves, the conflicts that we have with others will seem less important to our days, and soon our lives. We learn that through self-control we can create our own existence of harmony instead of discord. Our lives are short and precious; too short to allow others to negatively impact our days. Give yourself the opportunity to flourish through positive energy; you will change in many incredible ways.